If you are thinking about attending the Oregon Symphony's "Carmina Burana" concerts (May 17, 18, and 19), you'd better act quickly, because all of the concerts are almost sold out. This piece features three soloists, the Pacific Youth Choir, and the Portland Symphonic Choir (I'll be singing with them). Also on the program is the orchestra's first performances of Messiaen's "L’Ascension" (The Ascension). For more information and tickets, see the Oregon Symphony web site. Otherwise, take a look at this article about an arena-sized presentation of Carmina Burana in England. For around 90 minutes last Sunday the Oregon Symphony gave an emotionally satisfying interpretation of Gustav Mahler’s Symphony No. 9 in D major, a colossal work that can separate the best orchestras from the also rans. The orchestra, under the direction of music director and conductor Carlos Kalmar plumbed the depths of masterpiece, written at the end of Mahler’s life when he was suffering from a serious heart ailment and problems related to stress. This symphony is usually described as Mahler’s farewell to life, and I could easily feel that underlying sadness from the outset of the first movement, when the music repeatedly spirals downward. The music didn’t wallow in a puddle of sorrow, because the orchestra revealed the conflicting emotions of someone who struggled to rally himself and delay the inevitable for as long as possible. Concertmaster Jun Iwasaki played his solo passages wonderfully. Principal timpanist Paul Salvatore made created ponderous heartbeats. The second movement took on a much lighter character as orchestra embarked on an Austrian peasant dance called a Ländler, which was announced with humor by principal bassoonist Evan Kuhlmann. The rustic and joyful quality of this part of the symphony made me think that Mahler was going back to some earlier part of his life when things were happier. Comical also was the way that a couple of the phrases were punctuated at the end by the tuba, played wonderfully by principal JáTik Clark. The Rondo-Burleske of the third movement had a hurly-burly quality that calmed down and brought back the sense of tragedy. I really enjoyed he rainbow of notes from principal harpist Jennifer Craig after the commotion passed by. The fourth movement, Adagio, contained so many interesting sounds that it was a challenge to take them in. I loved the pairing of the first violins and the contrabassoon. The French horns sections elevated their instruments altogether to make a glorious, burnished sound. Principal cellist Nancy Ives performed her solo marvelously, and the violins, violas, and cellos concluded the symphony on a somber notes as if Mahler had come to grips with his aloneness in the world. Outstanding was the way that Kalmar and the orchestra could speed up and slow down organically. They also blended well whenever they increased or decreased the volume. There were times when the sound seemed to dwindle down to nothing at all. The string sections played superbly together. The large woodwind section (18 in all) were magnificent. The brass were polished to a high relief. Kudos to principal trumpet Jeffrey Work and to principal French horn John Cox. A couple of times in an exposed passage, a high note on the piccolo, played excellently by Carla Wilson, matched the strings perfectly. All in all, this performance of Mahler’s 9th was the highlight of the season for me. I would’ve liked to have attended every evening just to catch differences in nuance from once performance to another. A big thank you to the orchestra and Kalmar for taking a chance on this demanding work. Their performance was rewarding in every aspect. Seat count: It was a nicely filled house on Sunday evening. I’m guessing that more than 80 percent of the seats were occupied in the balcony. Portland State University’s production of Puccini’s La Boheme received a strong performance on opening night (Friday, April 25) at Lincoln Hall. The singing and acting by the principals won over the audience with convincing portrayals of young, poverty-stricken artists and lovers in the midst of their struggle to survive in Paris in the 1830s. It’s really a treat to watch young singers who are roughly the same age as the characters in the story. As the poet Rodolfo, Lucas Tannous sang with ardor and a beautiful tone. Tannous wisely paced his voice so that he could deliver Che gelida manina and all of the other demanding arias with élan. In the role of Mimi, Anna Viemeister showed plenty of poise to go along with her rich, soprano sound. Her last passages, sung while lying flat on her back, were riveting. I heard audience members blowing their noses – a sure sign Viemeister’s Mimi has touched their emotions. Baritone James Rose created a solid Marcello, the painter and confidant of Rodolfo. Rose’s ability to convey the torment of a jealous lover was especially good during the scene at the Cafe Momus when Musetta, played wonderfully by Audrey Sackett, teased him mercilessly. Rose and Sackett also showered some sparks on the stage when their love was on the rocks during Act III. Michael Miersma cut a dashing Schaunard, the musician, singing, dancing, mock fighting, and doing whatever was asked with the utmost panache. Miersma's baritone had lots of volume and a burnished quality. Jeremy Griffin made a case for philosopher Colline, but his voice seemed to be wearing out towards the end. Still, Griffin saved enough for Vecchia zimarra, when he bids farewell to his old coat before he goes out to sell it. Ben Kinkley, in the role of the landlord Benoit, and Jason Duika as the sugar daddy Alcindoro were simply hilarious. The stage direction of Tito Capobianco was outstanding in every which way. For starters, the stage area was pretty small, but that didn’t stop the four men from camping up the first scene with all sorts of buffoonery, including a mock sword fight. The agility and athleticism of Tannous, Rose, Miersma, and Griffin moved the story along, but didn’t detract from it. Sackett in the big dinning scene during Act II was no slouch either. She cavorted with all of the guys and made it look natural. The scenery by Kim A. Tolman was just right for evoking the artists threadbare attic, a splashy outdoor setting for Café Momus, and a chilly customs post at the city gate. The period costumes added well to the overall effect as did the lighting by Jeff Forbes. 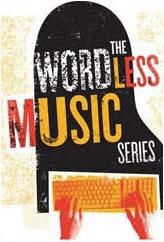 Excellent supertitles, provided by Words for Music, helped the audience to follow the opera, which was sung in Italian. Conductor Ken Selden and the PSU Opera Orchestra supported the singers with a fine understanding of Puccini’s music. They were a bit scratchy here and there with some intonation problems, but they never played too loudly for the singers. They also transitioned well from uptempo parts of the opera to the slower, more languid sections. This production is another feather in the cap of PSU’s music department, which has won two first place awards in the National Opera Association Production Competition for The Marriage of Figaro (1999) and Don Giovanni (2002). Last year’s Cosi fan Tutte came in second. We will find out later how this one does. This Sunday, April 27th, at 2 pm the Bach Cantata Choir will sing three works at Rose City Park Presbyterian Church. You can hear one of Bach's rare motets, "Lobet den Herrn, alle Heiden" (Praise the Lord, All Ye Nations, BWV 230), and two cantatas: Cantata #6: Bleib bei uns, denn es will Abend werden (Bide with Us, for it will soon be Evening) and Cantata #66: Erfreut euch, ihr Herzen (Rejoice All Ye Spirits). Ralph Nelson leads the 40+ voices of the choir in concert that lasts a little longer than an hour. Donations are accepted. Rose City Park Presbyterian Church is located at NE 44th and Sandy. The concert starts at 2 pm. To celebrate Holy Week in the Orthodox church (Orthodox Pascha, or Easter, is this coming Sunday), Cappella Romana's Arctic Light concert will be broadcast tomorrow (Friday, April 25th) on Performance Today. The Arctic Light concert was recorded in St. Mary's Cathedral in January and its program featured music of the Finnish Orthodox church. Performance Today will add this broadcast to their web site's selection of past programs and make the audio available for replay for another seven days. Also, I briefly talked with Mark Powell, Cappella Romana's executive director, and he mentioned that CR just received a grant from the Finlandia Foundation so that they can do a recording of Finnish Orthodox music from the Arctic Light concert, but this time the recording will be under controlled conditions (not a live concert recording). 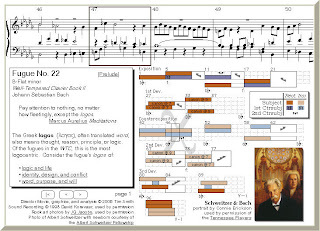 Charles Noble in his blog, Daily Observations, has posted commentaries and music samples that are very helpful in understanding Mahler's 9th Symphony, a very complex work. I hope that you get a chance to explore Noble's blog before experiencing this masterwork, which will be presented this weekend by the Oregon Symphony. I published an article about the PCP in Crosscut today. It's called Cellos rock in Portland. When I first heard about the Wordless Music Series’ Portland shows and read WM’s mission statement, I was immediately excited and wanted to be a part of spreading the word somehow, doing my part to “evangelize classical music” to those who probably aren’t familiar with it, as WM founder Ronen Givony put it during his pre-concert notes on Friday night. [Go here to read an interview I conducted with some of the performers in this series.] As a young(ish) classical music performer and aficionado, I attend and perform in dozens upon dozens of concerts each year, and one thing that often strikes me is the age of the patrons I see in the audience. By and large, (and this is more true at some events than others), the crowd is older, and quite often consists principally of a sea of gray and white-haired music lovers. Now, I am no ageist, and one thing seeing these types of audiences immediately tells me is that wisdom and good taste can indeed come with age. However, it also leaves me with pangs of concern, a worry for the future of this wonderful, fragile world of art music. Although the death knell for classical music has been prematurely sounded time and again over the last century, to me it seems like the future of classical music, post-classical music, art music or whatever term you want to use, faces challenges that it has not seen before. While much classical music is immediately accessible even to the novice listener, let’s face it: this is a very complex idiom, one that holds in its tradition all the centuries since Neanderthals first pounded on a hollow log and determined that it was good. A lot of classical music is very much an acquired taste, and acquiring a taste almost always involves an intentional seeking. Rock ’n roll as well as hip-hop (which is rapidly becoming the world-wide voice of youth culture), for all that I love both genres, have entrenched into pop culture the standard of the 3-4 minute song. And now in these heady information-age days of ours, with I-pods and Play Station 3s and blogs and digital cable, the idea of a young person (read: future audience for classical music) having the desire to sit down and listen to a deep, weighty, mysterious Shostakovich string quartet can be unfathomable, and what is scarier, completely undesirable to the uninitiated. I’m not saying anything here that hasn’t been said a thousand times before, but it gets back the idea behind Wordless Music, which, simply stated, has the goal of tearing apart boundaries between different genres in the hopes of exposing audiences to sounds they probably would not otherwise seek out. The first concert featured Chris Willits, an ambient/experimental guitarist from the Bay Area, followed by members of the Portland chamber group Classical Revolution Portland (CRPDX) and the ambient music superstars Stars of the Lid (SOTL), a reference to the patterns of color and light one sees on the inside of the eyelids when eyes are closed. I wasn’t sure what to expect at the WM concerts, although one thing was readily apparent: the crowds at the Holocene on Thursday and the Old Church on Friday would be very different. I was right. The Holocene is a quirky club on 10th and Morrison, and the people here were definitely not the type I am used to seeing at a classical music concert. The place was thronged with 20- and 30-somethings; lots of hipsters (a term everyone hates and no one will admit to being) with thick glasses, loose jeans, corduroy shirts and thrift-store blouses. Geek chic was the rule of the evening. I introduced myself to Hannah Carlen, the promoter from Spectre Music who is the PDX liaison for WM. She had been very helpful when I approached WM and Spectre and offered to cover the series, and put me in contact with the artists I was able to interview prior to the concerts. At the venue she introduced me to Ronen, the founder of WM, as well as Mattie Kaiser and Briana Ratterman, musicians from CRPDX. There are a number of rooms at the Holocene, and I was actually unsure where the performance would be, so I ordered a beer and sat down at one of the last remaining tables. I casually observed three djs at turn-tables on a low dais spinning electronica, one hapless, melancholy tune fading disjointedly, yet somehow comfortably, into another. Dim lights hung from the vaulted, exposed wooden beams high above, and a projection of haphazard, repetitive psychedelia crawled along quietly behind the guy selling cds and records, honest-to-god vinyl, at a table on the back wall. The show started late and was in a small hall off to the back of the main room. I dragged a chair in and sat down, waiting for the show to begin. I struck up a conversation with a young-looking guy next to me, Jeff Jacobus, who is a photographer covering WM for a Danish music blog. [Go here to see Jeff’s own blog containing photographs of both the Holocene and Old Church concerts.] It was a very enlightening conversation, as we seemed to come to this show from the exact opposite perspectives: I, the classical music fan at my very first ambient show, and he a knowledgeable electronic music fan who didn’t have much experience with classical music. (In short, exactly the type of interchange that WM seeks to promote.) A long time SOTL fan, he dropped a number of names that probably most of the other people in the crowd would recognize (all of which meant nothing to me) until he finally mentioned one I had heard, Brian Eno. Although I’m no stranger to electronic music in general, my background in ambient/drone music is very limited, and Jeff gave me some good terminology and explained concepts that would help me frame my experience. Chris Willits came out and immediately launched into his program, standing amidst a maze of mixers, sequencers, amps, keyboards and a spaghetti-like tangle of cords. His work was called Improvisation for guitar and custom-built software. It began with echoing loops of a simple, distorted guitar lick folding back in on themselves and shifting subtly. The actual performance was very confusing to me at first. Chris, wearing headphones, moved back and forth rapidly between guitar, laptop, and sequencers, constantly fiddling with knobs and checking the monitor of his iMac like some post-modern Wizard of Oz, only without the pretense of a curtain. At first it was hard for me to tell if he was actually performing, or just adjusting electronic gadgetry in an attempt to reach the desired setting. Eventually I picked up on the fact that this whole frenetic enterprise was part and parcel of the performance. The room was dimly lit with various colored lights and there were visual projections all throughout, from clouds and close-ups of weeds growing through cracks in the sidewalk to amorphous blobs of constantly shifting color throbbing in time to a more-felt-than-heard electronic heartbeat. While some of this music was uninteresting to me there were moments of undeniable beauty, such as when he struck a series of chords on his guitar and then filtered them to such an extent that they reminded me of the voices of dead passengers on a sunken ghost ship, bubbling up from the depths of a murky green sea. Next up was CRPDX, with Dmitri Shostakovich’s titanic String Quartet No. 8 in C minor. I actually missed the opening moments waiting in the long line for beer, but I will say this about hearing classical music at a club: as music and craft beer are my two great passions, it was singularly enjoyable to be able to sit in the dark and sip a bottle of Rogue Brewery’s Nut Brown Nectar while listening to the haunting strains of a Shostakovich quartet. This work was performed by Lucia Conrad and Mary Kazmierski, violins, Mattie Kaiser, viola, and Erin Winemiller, cello. This piece, perhaps the most-often performed work in his seminal collection of quartets, was composed in a furious 3-day spurt of creativity when Shostakovich was in Dresden in 1960, and it was intended as a remembrance of the victims of fascism and totalitarianism. I attempted to pay special attention to the audience, as I surmised this style would be unfamiliar to many of them. It seemed like a number didn’t quite know what to make of it at first, but they sat in rapt silence and paid close attention; classical music audiences who are often coughing, shuffling and whispering could learn a thing or two from the serene meditative complacence with which this Holocene crowd attended the Shostakovich. One other thing that suggested an unfamiliarity with classical etiquette was an attempt to clap between movements, although the later movements flowed attaca one into the other, so that eliminated this problem. This was an audience that sincerely wanted to hear new music, as shown by the growing throng that was willing to sit packed together on the cold concrete floor. The syncopated atonality that permeated large parts of this work proved a stark contrast to the dreamy ambient music immediately preceding it, and it actually took me a moment or two to adjust aurally. The opening Largo was very somber and intentional; it began with a sobbing motif that Shostakovich often uses as his musical signature. There were a few intonation problems right at first but they soon worked themselves out. Part of it could’ve been the loud hum of the overhead fans which was inaudible during the amplified sets of the other performers. But, it interfered with my hearing and could easily have proved a distraction to the unplugged musicians attempting to play in a whispering pianissimo. By the time the Allegro Molto was in full swing the audience was hooked. The viola dominated an important segment of this movement, and Kaiser rendered these fiendishly difficult phrases with demoniac intensity, hammering out triple and quadruple stops with such ferocity that I thought strings might snap. I couldn’t help but visualize extreme violence during this section, families torn from their roots and ripped apart to be scattered unto death by the winds of a soulless, inhumane force. The Allegretto was a pleasant contrast to this, a bacchanalian dance that belied the fury of the former movement. The work closed with two sparse Largos, and Lucia Conrad played the return of the opening theme that dominated these movements with as much mesmeric intent as any fan of hypnotic music could hope for. CRPDX finished with the minimalist Spiegel im Spiegel (Mirror in Mirror) by Arvo Pärt, a consonant piece more in keeping with the overall dreamy timbre of the evening. For this work Kaiser was joined by Briana Ratterman on an electronic keyboard. This was a simple piece featuring a languid, happy melody on the viola hovering over a repetitive motif on the keyboard. Ratterman had a deceptively challenging task in keeping the ostinato fresh and invigorating, and she did this well. Stars of the Lid were the headliners, and there were many long-time fans there. With one member of this duo living in Brussels and the other in L.A., apparently American tours have become increasingly rare for them, so there were a lot of excited people when they took the stage. This ensemble was composed of SOTL members Brian McBride and Adam Bryanbaum Wiltzie, and they were joined by Ella Baruch on viola, Kate O’Brien on Violin, and cellist Julia Kent. All of the strings were plugged in to amplifiers. While putatively there were five pieces performed by this group, to be honest I couldn’t distinguish one from another, but that didn’t distract from my enjoyment of the closing act. Hallucinatory projections were a prominent feature of the ambient/drone performances I heard that evening, and it was a good match. Projectionist Luke Savisky was responsible for the visual effects. These formed an all-encompassing burble of colors and slowly mutating shapes that served to enhance the trance-like state this music wanted to induce, creating a synesthetic jumble of the visual and the aural. All around heads were bowed in silent reflection, and a girl stretched out on a cushion in the window box, seemingly lulled to sleep by this effervescent lullaby. The strings, situated in the center of the stage in between Wiltzie and McBride, played a virtually unvarying, agonizingly slow melody over and over again, and I imagine it was no easy task to keep coordinated at such an exaggerated adagio. Waves of somnolence washed from the speakers as Wiltzie and McBride both wielded guitars from the shadows off to the side. After a long buildup, the music did reach a crescendo towards the end. A sternum-rumbling bass gradually arose, and I could hear the twanging of guitar strings as a lightning-fast sequence of chords was struck, only to be heard four or five seconds later as a muted, warbling concatenation of sound, like waiting for the slow rumble of distant thunder long after a blinding flash of light. Finally the music disappeared as mysteriously as it had started and I was left in silence, staring at an eyeball-like blob melting on the back wall. I admit to being a bit groggy from the good beers and the 1 am ending time of the Holocene show the previous night (followed by a full workday), but I was in good spirits as I walked through the doors of the Old Church on a downright frigid Friday evening. I attended with my girlfriend Kristin, and we sat near the stage. Jeff, the photographer from the previous night, was probably as unsure of the setting as I had been at the Holocene, and we talked for a while, this time more about classical music. The crowd was indeed different from the previous evening, with many more traditional-looking classical music fans (although what does that mean?) but there was a good mix of the ambient/electronica crowd there as well. Unfortunately some of those folks left after the opening act Eluvium, which seems unfortunate since the whole point of WM is in large part to expose yourself to music you might not normally hear. They missed a spectacular, exhilarating performance by Third Angle in the second half. Ronen Givony spoke briefly both nights, and he wisely directed his comments to the differing though cross-fertilized crowds that made up each show. Givony is a relative newcomer to classical music, and on Thursday he addressed the crowd with an amusing anecdote about how he discovered what chamber music is, and how it is connected integrally to the music they were there to hear. On Friday night, he challenged the audience to listen closely, and to determine for themselves what it is that links composers who create music on laptops with those who write traditional acoustic chamber music. Matthew Cooper is the man behind Eluvium, a drone/ambient project based in Portland. He has performed for WM before, and so he had a contingent of fans there specifically to hear him. He opened with a challenging (for the listener) piece called Miniatures, which is a brand new composition from him. It started with a sad, melodic guitar line that sounded like a slowed-down, dreamy surf-rock riff. Gradually an urban soundscape intruded upon this repetitive theme, eventually overtaking it until the original music could hardly be heard. These folded into a cacophonous feedback loop that grew louder and louder each time the theme began again, until it reached almost ear-splitting levels. This called to mind a genre of music called "danger music," the milder forms of which consist of making the audience fear that a damaging level of sound will be directed at them. (The most extreme pieces call for among other things lobbing anti-personnel bombs into the audience or the conductor gouging out his eye, but these misanthropic compositions are theoretical and fortunately never performed.) I noticed the patrons in front of me with fingers solidly plugging their ears as the wall of distortion grew louder, louder, louder, until I thought I would plug my ears too. Perhaps I was a little "ambiented -out" from the previous evening, but it became tiresome and I was thankful when this work finally ended. During the intermission I had a chance to speak with Mattie Kaiser, and she had a thought that elevated my thinking on this; for after all, isn’t creating disturbing tension and borderline anxiety a valid musical goal as well? Whether life imitates art or vice versa, life isn’t all lollipops and daisies, so I suppose there’s no reason music should be either. There were several other works in the Eluvium performance, and while more segregated than SOTL, I still had trouble sometimes determining where one ended and another began. There were two simplistic keyboard works, thought not without charm, one of which was a melancholy waltz that reminded me a little of Elliot Smith. 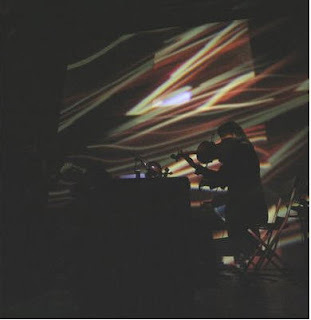 My favorite piece of his (possibly Talk Amongst the Trees) began with a shoegaze guitar line that was slowly recycled, laying back upon itself in minutely altered gradations of time until Cooper began hammering on the strings with his fingers to effect a muffled percussive sound. This one also featured a blasting soundwall at the end, though not to the extreme of the first piece. It made me think of M.C. Escher’s woodcut Metamorphosis, where an idea evolves almost imperceptibly from one iteration to the next until it is completely unrecognizable from that which preceded it only a few stages ago. Third Angle New Music Ensemble began the second half with a solo work for violinist/artistic director Ron Blessinger. It was called RJ Meets LJ Meets ED by local composer David Schiff. The odd title references the initials of several jazz and blues composers from years past, including Robert Johnson. True to its name, it jumped between a series of jazz and blues themes. It was a short, difficult piece that struck me as rather wonky at first, but eventually it grew on me, especially the bluesy coda that kept repeating itself at the end of each verse. Cellist Hamilton Cheifetz joined Blessinger for Duo for Violin and Cello by Zoltan Kodaly, and Cheifetz explained that the rhythmic accents found in this work mirror certain speech patterns in Kodaly’s native Hungarian language. Cheifetz and Blessinger seamlessly dove into this rapid, offbeat piece, see-sawing back and forth and tossing a tick-tock pizzicato from one to the other, with snippets of rich Hungarian folk songs popping out here and there. Next they were joined by Peter Frajola on second violin and Brian Quincey on viola for the meat of the program, beginning with a pair of lush vignettes for string quartet by the renowned Chen Yi. Her background as a forced laborer during the Cultural Revolution, her experiences as a conservatory student where she was only allowed to play communist anthems, all of this seemed to feed directly into the almost surreal integrity of these meaningful works. The first piece was Sprout, from 1982 near the beginning of her composing career. This work reflects the ebullience of youth and began with an anthemic melody that featured the haunting, slightly alien sonority that makes Chinese art music so engaging to Western ears. It mutated from this expansive, windy opening into a distant, spritely sort of passepied, and was over far too quickly for me. Burning, composed in the days immediately following the September 11, 2001 tragedies, could not be more different from Sprout, and Third Angle did well in choosing such disparate works to showcase the vast depth of Yi’s emotional repertoire as well as their own virtuosic capabilities. This composition literally exploded right out of the gates, and never let up for a second. It seemed like Sturm und Drang carried to its uttermost conclusion: sighing, sawing, yowling, and pleading, Third Angle hammered out an incredibly thick chordal texture until suddenly, surprisingly, all voices joined together in scratchy, ascending glissandi that dwindled away into nothingness. The final work of the evening was the exciting String Quartet No. 4 by Portlander Thomas Svoboda, which Blessinger explained was meant to be a reflection on the Iraq war. The placement of this work after Yi’s Burning struck me as symbolic: first we had the terrible tragedy that began it all, followed by a work that dwells on the continuing sorrow which sprang from that terrible day. It opened with a Vivace that was extremely scant at first, beginning with duplet motif starting with one instrument and rapidly, seemingly randomly taken up one by one by all the others, only to reduce itself just as quickly and start again somewhere else. The second movement was marked Adagio-Vivace-Adagio, and began with an eerie tune that soon gave way to a mildly playful Vivace, with a complex, loud plunking pizzicato that was jerky and yet somehow cheerful. The ultimate Adagio was pensive and serious, and closed with a three-note bass drum pattern quietly intoned by Frajola each time the rest of the group ended a certain phrase, sounding like the muffled crump of artillery fire retreating into the distance. And finally it was all over, with a dull, ominous thud. Third Angle shone brightly Friday night, choosing powerful, important works that highlighted their spectacular precision and informed musicality. I think this was instrumental in helping further the goals of WM, that is to say, the dialog between different, though entwined sonic worlds. One of the reasons I wanted to talk to the performers, the promoters, project founders and concertgoers during this past week was to see for myself if such a project has a hope of being successful. Can classical music survive the information overload age? Or post-classical music, if that is the correct term for these brand new works. Certainly it seems that the term ‘classical’ as it is commonly used is not always an accurate descriptor, but these works are linked in an unbroken chain to the early music that I love so dearly, so their fates, it would seem, cannot be separated. In speaking with Jeff Jacobus after the show, he talked about how much he enjoyed the works he heard, and that he was interested in seeing more live performances of this type of music. I realize that that is only one person, but every revolution, every worthwhile goal or idea must needs make converts one at a time. I know for my part that I am interested in exploring more of the strange electronic dreamscapes that I have been exposed to the past few days. Despite, or maybe because of, the vast differences in style and performance of the artists in Wordless Music’s shows, I believe that I do see the commonalities that are inherent in the act of musical composition, whatever form the end product takes. I’ve heard rumblings that these shows will not be the last WM presentations in Portland, and I certainly hope not. I would encourage traditional classical music fans to give a thought to attending works like this. What better way to spread the gospel of one’s own music than to reach out and give appreciation to that of others? How better to draw new fans and younger audiences who will ensure the continuity of this music that gives so much meaning to our lives? It can’t stop at the ambient/electronica frontier, and obviously needs to reach out to fans of other genres. But a good start is a good start, and Wordless Music is an admirable project that I hope will develop and expand for a long time, and this mirrors the hopes I have for this music that I so desperately love. Today's Columbian has my review of the Vancouver Symphony's concert yesterday afternoon. The concert lasted 2.5 hours and it hailed and snowed pretty heavily during the last thirty minutes, so the drive home was a little tense. By the time I got in front of my computer, I only had 30 minutes to write the review (a 6:30 pm deadline). Fortunately, I had scribbled some beginning paragraphs before the concert came to an end. You can read Rich's final column here. Obiter dictum: “Night Music” goes dark next week after 16 years. I will write about the last of this year’s Monday Evening Concerts, which I helped to save a couple of years ago as part of my job. The decision to close down my column was not mine. The notes of protest have, of course, been wonderful; they come because we all realize that music — all music but especially the endangered kind — needs people to speak for it, certainly more than one voice per community. Meanwhile, I’ll continue to write about music — periodically for the Weekly, and regularly in a blog (www.soiveheard.com) that friends are setting up, for KUSC (which was on the phone first thing), wherever. My first print was in 1944; I’m not gonna stop now. Jun Iwasaki, Oregon Symphony's concertmaster, and Amy Schwartz Moretti, the orchestra's former concertmaster, will play several concerts this summer at the Seattle Chamber Music Society's Summer Festival. Too bad that Iwasaki and Schartz Moretti are not at the festival at the same time so that they could be featured in the same piece. That would be nifty. The Oregon Symphony displayed an enjoyable variety of orchestral color in their most recent concert series. For starters, the string sections of the orchestra were divided in half for Béla Bartók’s Music for Strings, Percussion, and Celeste. Then virtuoso Sharon Kam made her debut with the orchestra as the soloist in Mozart’s Clarinet Concerto. And finally, the large version of the orchestra to performed Richard Strauss’ Suite from Der Rosenkavalier. I heard the Sunday evening performance and left the concert hall with some spring in my step. I’m almost getting used to seeing Oregon Symphony split into two chamber ensembles. Just a month ago the orchestra played Johann Christian Bach’s Sinfonia in a double-orchestral setting. This time, the Bartók piece called for two string orchestras to be positioned on either side of a percussion battery that included a piano and a xylophone. From my own singing experience with the Portland Symphonic Choir, I know that the Schnitzer’s stage is far from optimum when it comes to hearing across the stage. Yet the way that these ensembles performed Bartók’s work was marvelous. It’s a real credit to how well the musicians listen to each other and how well Carlos Kalmar keeps them together. Bartók is well known for switching meters and asking for dramatic changes in dynamics. His music is always challenging on many levels, and the orchestra rose to conquer those challenges with gusto. One of the fascinating things occurred in the first movement when it seemed to take forever before the first violin section in Orchestra 1 got to play any notes at all. I supposed that only three minutes passed by, but it seemed (at least visually) to add some tension to the music. However, the music was extremely meditative, and I heard (and saw) a slow build up of sound as more and more sections of strings joined in. It was like watching someone make a multilayered cake on a very calm afternoon. Then after all of the strings were sawing together, they made a terrific crescendo as they played down the scale. Each movement contained unusual sounds and instrumental combinations. The second movement, for example, had a passage that paired the timpani and bass fiddle. The third movement began with pensive notes from the xylophone that helped to create a mysterious atmosphere, but then the timpani would create a tone that changed pitch, which seemed really odd and almost comical. The fourth movement had a joyous, dancelike quality, and the piano (played wonderfully by Carol Rich) added a jaunty yet slightly mocking feeling to the whole effect. Overall, the orchestra created a rich, and satisfying soundscape that I would love to hear them play again. Then after intermission, guest artist Kam came out on stage with her basset clarinet to perform Mozart’s Clarinet concerto in A major, K. 622. 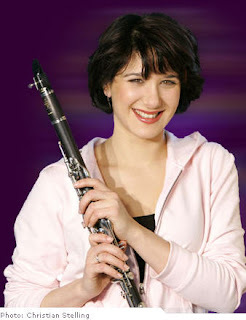 The basset clarinet is longer than a normal concert clarinet, because it has additional keys that extend its lower register. Kam gave the concerto a silky, smooth sound that worked well throughout the piece. I loved her elegant, lithe phrasing in the first movement, and there were tender and quiet moments in the second movement in which her low notes seemed to come out of nowhere. She finished the third and final movement with a joyous and yet elegant sound that seemed perfect to me. A friend of mine said that he almost became dizzy while watching Kam play, because she puts the clarinet in constant motion. It’s sort of a swirl that is a bit distracting, but it also made me wonder how she can make such beautiful sounds at all. I also loved the way that the orchestra played with her. The ensemble has never played Mozart better, and the collaboration of Kam, Kalmar, and the orchestra received a standing ovation. On Monday evening at the Portland Symphonic Choir rehearsal, I talked with fellow Northwest Reverb writer Lorin Wilkerson about the Mozart piece. Wilkerson felt that Kam played it way too evenly… so evenly, in fact, that it lacked a pulse. So he was disappointed. But he was sitting under the balcony, which may have affected his response to the piece. The concert ended with Strauss’ magical themes from his opera, Der Rosenkavelier, in an arrangement by Arthur Rodzinski (music director of the Cleveland Orchestra 1933-1943, the New York Philharmonic 1943-1947, and the Chicago Symphony Orchestra 1947-1948). The horn section sparkled from the outset in the Oregon Symphony’s performance, inspiring their colleagues to deliver a thrilling ride. Many of the orchestra’s principals played with much polish, including French hornist John Cox, trumpeter Jeffrey Work, oboist Martin Hebert, and concertmaster Jun Iwasaki. Kalmar deftly slowed down and sped up the tempi in the waltzes and also pulled back the sound very nicely – all of which created a delightful atmosphere and evoked images from the opera. This was great way to end the evening. Notes about the audience: Sunday night was very full, which was a pleasant surprise when you take into account the warm weather that we experienced. At the Saturday concert, Wilkerson sat almost behind the man who yelled at Elaine Calder. See Charles Noble’s blog for more on this incident. Wilkerson was pretty sure that it was the same fellow who yelled more or less the same thing at a previous concert. That man seems to be on a mission to destroy public appreciation for the big-time donors who make these concerts possible. If I meet him, he will get an earful. Today's Columbian newspaper contains my preview of the Vancouver Symphony's young artist concert. The kids who are featured in this concert won the opportunity to perform as a soloist with the orchestra and $1500 each. Not bad for a teenager. Wordless Music Series is a project based in NYC that is “devoted to the idea that the sound worlds of classical and contemporary instrumental music—in genres such as indie rock, free jazz, and electronic music—share more in common than conventional thinking might suggest.” The most logical way to illustrate this is to take performers of different musical styles, throw them together and have a concert in the hopes of attracting fans from diverse backgrounds, thereby allowing them to hear live music of a type they might not normally listen to. That’s exactly what will be happening at The Holocene this Thursday night and at the Old Church on Friday night, when Wordless Music presents its first PDX shows, in conjunction with Portland’s Spectre Entertainment Group. I recently had a chance to ask some questions of Matthew Cooper, along with Ron Blessinger, the artistic director of Third Angle, and violist Mattie Kaiser, founder of CRPDX. Mattie and Matthew responded via email, and I spoke with Ron over the phone. The Wordless Music Series is devoted to the idea that "the various boundaries and genre distinctions segregating music today...are an artificial construction in need of dismantling." How does this philosophy fit in with Eluvium's/Third Angle’s/CRPDX’s music/mission? Matthew: I'd say the best way for me to answer this--purely from my compositional perspective—is that I am constantly trying to push myself into areas I have not been to before musically--whether working with percussion or string ensembles or horns or ambient laptop work or solo guitar or piano work. I find myself relating to the forms of classical music more than anything else, as I see similar structures in classical composers. I think that the Wordless Music Series is trying to strike up the conversation that this is not too uncommon in many modern music makers, as we are seeing many instruments traditionally reserved for classical music popping up in modern rock among other genres. Ron: People have a certain perception of classical musicians. We fit a stereotype, I suppose—people who sit down with music stands and learn the rigid traditions of European “art music,” whatever that means. The reality is that classical music in America is going off in a million directions. As classical musicians we need to be more rounded—well-versed in improvisation, familiar with jazz and all types world music. Mattie: The goal of Classical Revolution PDX is to dismantle the conventional ideas behind "classical music." There tends to be a set of rules involved in a classical concert that can be quite intimidating. We are trying to provide an atmosphere where the audience is encouraged to listen to amazing pieces of music without stern social customs and high ticket prices. By taking chamber music out of the recital hall and making it more accessible to an audience who does not otherwise hear such music in a live context, Classical Revolution PDX strives to make the public aware that classical music is still relevant and can be enjoyed by all. Do you feel that 'genre-bending'ensembles/performances enhance appreciation for all the styles represented? Matthew: It's hard to say-- I guess hopefully so. I find that attraction to sound should lead one into various forms of it…it doesn't always lead to a new favorite instrument or group of musicians, but it may. The softness and melancholy of a Chopin nocturne can be found in a modern electronic work, or the playfulness of a Bach piece in an instrumental band with guitars, bass, and drums. I would hope that finding new things by using something familiar as a vessel would be the simplest way to help people find other sounds that speak to them, and perhaps even make them feel something they’ve never felt before. Ron: The words used to describe the distinctions between genres are marketing tools. Now, marketing is a form of communication with consumers, so it’s not irrelevant. There are a lot of variables in a live show: for instance, just because you like jazz and go to a jazz concert doesn’t necessarily mean you’ll like that concert. A lot of it has to do with the performance itself. Genres, styles, marketing—they all matter, but in the end, good music is good music. Mattie: Absolutely! The pairing of these ensembles in the Wordless Series provides an opportunity for the audience to discover that different genres have a lot in common. Many of the "non-classical" ensembles are deeply influenced by classical music and it comes through in their harmonies and orchestration, which classical listeners can enjoy. On the other hand, the audience that would typically only go to indie/electronic concerts can develop an understanding of the foundation of their music by being exposed to classical music. And to really prove that we're not so different, we even playing pieces by the same composer! Stars of the Lid and Classical Revolution PDX will both be performing pieces by Arvo Part, just in our own style. What encouragement to come check out the Wordless Music show would you give a 'purist' fan of any genre who might regard this undertaking with some hesitation? Matthew: Sound itself is more important than genre, style or era. Ron: We all have relationships in our lives. Whether we like to admit it or not, we have relationships with music. Whether it’s that piece by Kansas from your 6th grade sock hop or something from Led Zeppelin—the relationships change over time. I am going to be conducting Mahler’s 9th soon, and my relationship with it now is not what it used to be. This is for people who want to have a deeper relationship with the music they love, for people who want a richer understanding of their music. The DNA of classical music is very closely connected to that of our musical neighbors. Mattie: The more we get together, the happier we'll be! No, really, there are hundreds of traditional classical concerts throughout the year, and a plethora of indie/electronic concerts happening here in Portland, but how often are you able to see them together? The Wordless Music Series is providing Portland with a completely innovative a way to see a concert and be exposed to something new, and we're all truly excited to be a part of it. Matthew: I hope to see you there. Mattie: I would love to inform your readers that Classical Revolution PDX is an open network of classical musicians, and if any of them would like to be involved in future performances to please visit our website www.classicalrevolutionpdx.org and join the revolution! Crosscut reported earlier today that Melinda Bargreen has taken the buyout offer from The Seattle Times. Bargreen has served that newspaper as its music critic for 31 years, which is probably the longest tenure of anyone in the Pacific Northwest. According to the letter she sent to friends and colleagues (quoted at length in the Crosscut article). Bargreen leaves the paper on an amicable note and may do some freelance writing for them in a few months. The news of Bargreen's departure from The Seattle Times, is a real blow to arts coverage in the Pacific Northwest. My colleagues at The Gathering Note, a blog that covers Seattle, Portland, and Chicago, will certainly pick up their pace. Zach Carstensen's most recent posting points out that some newspapers haven't figured out how to address its classical music readership. I am glad that The Oregonian has David Stabler as its regular critic and James McQuillen as its freelancer. The coverage that they give to classical music in the Portland metro area is crucial to the life of arts groups here. I hope that The Oregonian doesn't fall into the trap that is ensnaring many other papers. A healthy dialog about the arts helps to create a vibrant community. That's what I'm trying to foster with this blog. There was a time when most cities had several newspapers and each paper had a music critic. Blogs can help to keep the arts alive and well. There are more classical music groups than ever before in Portland, and it's a shame most receive no coverage at all. "The newspaper, which will discontinue regular classical music coverage, is among the 16 outlets owned by Village Voice Media, which earlier this month “laid off” the staff film and dance critics from its flagship, The Village Voice. Rich was fired on Monday at the age of 83. He has written a regular column for LA Weekly for 16 years titled “A Lot of Night Music.” His last column will be the week of April 24. He says he will launch a website, “So I’ve Heard,” named after his latest book, “So I’ve Heard: Notes of a Migratory Music Critic,” published in 2006 by Amadeus Press. Rich was pre-med at Harvard before “succumbing” to writing about music, for, among other outlets, the Boston Herald, Musical America, The New York Times and the New York Herald-Tribune. From 1968-1981 he served as classical critic for New York magazine; from 1984-88 he held that same job with Newsweek; the following year he moved west and became chief critic for the Los Angeles Herald-Examiner, a post he held until 1992, when he joined LA Weekly." LA Observed talked to Rich about his dismissal from the LA Weekly. 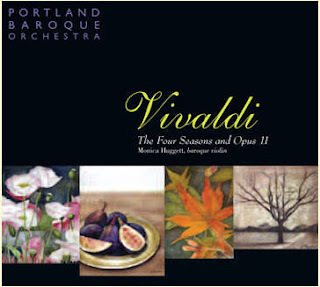 Just when you think that you’ve heard every conceivable rendition of Vivaldi’s Four Seasons, Monica Huggett and the Portland Baroque Orchestra prove you wrong by delivering a brilliant and unique interpretation of this beloved Baroque masterpiece in a recording that has just been released. And to top things off, The Four Seasons are just part of the package, a double-CD set that features six concerti from Vivaldi’s Opus 8 (which includes The Four Seasons), two concerti from his Opus 3, and all six concerti of his Opus 11. These are live recordings from concerts performed in 2005 (Opus 8) and concerts performed in 2007 (Opus 3 and 11), and each performance is crisp, fresh, and outstanding. The first CD opens with concerti 1-4 of Opus 8 with Huggett as the soloist. In each measure of each piece, Huggett and the Portland Baroque Orchestra come up with new ways to envision the music. The changes of tempo and volume within phrases show how much Huggett and the instrumentalists of this ensemble know each piece like the back of their hands. The ensemble has a terrific way of making the sound dwindle down to nothing before the slashing rainfall in the Presto of Concerto 2 (Summer). Other great moments include the rough-hewn sound in Allegro of Concert 3 (Autumn) that evokes a barnyard and the almost itchy quality of the Allegro non molto in Concerto 4 (Winter). The exuberance in the last movement of Concerto 4 is unrestrained and wonderful. Oboist Gonzalo X. Ruiz shines in concerti No. 9 and No. 12 from Opus 8. Ruiz, the PBO’s principal oboist since 1992, performs these pieces with a beautiful, mellifluous sound from top to bottom, and dispatches the quick, final movements of each concerto with élan. The fist CD closes with two concerto from Opus 3 (Hamonic innovation). Violinists Carla Moore and Joli von Einem play the solos in Concerto No. 8 splendidly with a perfect sense of blending voices. Violinists Rob Diggins and Adam LaMotte collaborate with violincellist Joanna Blendulf for the marvelous solos in Concerto No 11. Again the blend of sound is outstanding. See the Portland Baroque Orchestra web site for information on how to order this recording. You won’t be disappointed. The Oregon Symphony announced today that Carlos Kalmar has signed a contact extension to lead the orchestra as its music director for another four years. This is great news! Kalmar has led the charge in improving the quality of the orchestra and has challenged its members and the audience with many exciting, new pieces and guest artists. By stepping into new territories, the orchestra has been forced to rebuild its audience, and I've seen a fair amount of success this year. The blend of audience favorites, in terms of musical selections and soloists and some new pieces in next season's programs should put the orchestra on more solid financial footing. Now that Kalmar will be around for a few more years, I hope that people can step forward to help finance a recording. The orchestra has yet to produce a recording under Kalmar's tenure. Let's not let another four years go by without one. In the meantime, congratulations to Kalmar, the orchestra, and the orchestra board for continuing with Kalmar. On April 19 and 20, the first place winners of the Vancouver Symphony's Young Artists Competition will perform with the orchestra. The competition was held on February 24, but the winners were not publicized very much. It turns out that members of the Portland Youth Philharmonic swept up the strings division and the brass/woodwinds division. Each first place winner was awarded $1,500 and the opportunity to play with the Vancouver Symphony. Second place winners received $750, and third place winner were given $250. I've written a preview of the Vancouver Symphony concert that will feature the first place winners for The Columbian newspaper. It will run at the end of next week. In the meantime, check out the Vancouver Symphony web site for more information. The Spring 2008 issue of the Oregon Historical Quarterly has a fine article, written by Genevieve J. Long, about music director Jacques Singer, who directed the Oregon Symphony from 1962-1971. The article, entitled "Making 'Good Music'" contains many quotes from former members of the orchestra about Singer. Many of them describe Singer's volatile personality, which got in the way of his leadership and musical abilities, which then lead to clashes with orchestra members. Things came to a head in 1971 when Singer tried to cancel concertmaster Hugh Ewart's contract. Ewart responded by refusing to stand when Singer entered the stage for the first concert of the 1971-1972 season and the entire orchestra followed Ewart's lead. The turmoil between the orchestra and Singer affected the audience and the community at large, so the board of directors decided not to renew Singer's contract. The article covers the upswing in audience attendance, financial matters, and the state of the orchestra in general during Singer's turbulent tenure. Near the end of the piece it mentions that Michael Foxman was hired as concertmaster in 1973, but it neglects to mention that Lawrence Leighton Smith, a hometown piano prodigy who won the Mitropoulos International Conducting Competition in 1964, took over the reins of the Oregon Symphony in 1973. I know from having interviewed Norman Leyden, that Singer clashed with him over the pops program, which Leyden had created as part of the orchestra's season. Long's article does mention that in "1972, the symphony lost pops conductor Norman Leyden, who started a pops series. Fortunately, the Symphony got Leyden and his pops series back into the fold after Singer left. On page 68 the article incorrectly states "Pacific University in Tacoma, Washington" when it probably meant Pacific Lutheran University in Tacoma, Washington. All in all, it's great to get this glimpse into the history of the Oregon Symphony, and I hope that you get a chance to read Long's article. This week the Seattle Symphony will play several concerts in Southern California. From April 9 to 12, the orchestra and violinist Nadja Salerno-Sonnenberg will perform in Santa Barbara, Palm Desert, San Diego, and Los Angeles (Royce Hall at UCLA). 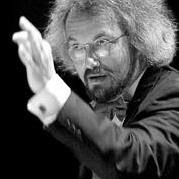 Gerard Schwarz will conduct all of the performances. Donate to the Portland Symphonic Choir and hit a double! The Portland Symphonic Choir has a special funding drive underway in which donations will be doubled up to the accumulated amount of $50,000. This funding drive lasts only until May 18th and has the goal of raising a total of $100,000 in a few weeks. Since its inception in 1945, the Portland Symphonic Choir has been a cherished and very active arts organization that is dedicated to presenting the great choral masterworks. As a member of the tenor section, I enjoy the challenging repertoire and hope that you can join me in making a financial contribution on or before May 18th. FYI, on May 17th through the 19th the choir sings Orff's Carmina Burana with the Oregon Symphony. I have heard that all three concerts are almost sold out. A new film entitled The Singing Revolution tells the story of how Estonians raised their voices in song and in defiance of the Soviet Union in order to achieve their independence. The move retells this remarkable, true piece of history, and the film that has earned raves from reviewers at the New York Times and the Los angeles Times among others. You can learn more about the movie at www.singingrevolution.com. I have not been to Estonia, but several of my colleagues from the Portland Symphonic Choir have traveled to that country to sing in their massive choir festivals,, which can involve more than 50,000 singers in a big stadium. Imagine the Civic Stadium being filled with singers! Well, that would hold only 25,000 or so. In Estonia, singing means so much more. Oregon Symphony concertmaster Jun Iwasaki teams up with an ensemble of friends to perform this evening at the Community Music Center. The concert features the Mendelssohn Trio in c minor, Op. 66, and the Octet for strings, Op. 20. Colleagues from the Oreogn Symphony who will play with Iwasaki are violinists Greg Ewer and Inés Voglar, violists Joël Belgique and Charles Noble, and cellists Trevor Fitzpatrick and Adam Esbensen. CMC Students and Alumni featured in the concert are Becky Anderson, Brandon Garbot, Boris Papadiuk, and Eloise Kim. The performance is a benefit for the Naomi Blumberg Endowment Fund for Chamber Music Education at the Community Music Center. Suggested donations are $20 for adults and $10 for youth (6-18). 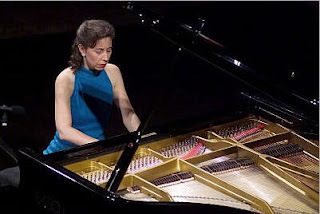 The CMC is located at 3350 SE Francis St.
A full house greeted Angela Hewitt on Tuesday evening at the Newmark Theatre for the second of two recitals by the acclaimed pianist. Portland Piano International presented Hewitt in these concerts, which were part of her World Bach Tour in which she travels to 40 cities around world to play all 48 Preludes and Fugues from Bach’s Well-Tempered Clavier. That anyone can memorize so many complex pieces is astounding, and the concert I attended featured 24 of these absorbing pieces, all of which were from Book II. Hewitt played the first 24 Preludes and Fugues from Book I on Sunday afternoon (see to David Stabler’s review of that concert). On Tuesday, the audience buzzed like a beehive in anticipation of the concert, and everyone quickly welcomed Hewitt with a thunderous round of applause when she first set foot on stage. She rewarded us with a mesmerizing interpretation of the Prelude and Fugue No. 1 in C Major, and then she kept going and going into all of the other 23 Preludes and Fugues with an astonishing ability to give each piece an individual and personal touch. The emotion range that Hewitt expresses with these pieces is incredible. You would think that Bach might be brittle and dried out, but his music in her hands is awe-inspiring. Hewitt has a wonderful ability to hold our attention by constantly varying the tempi or slightly emphasizing the right hand over the left on one phrase and then slightly emphasizing the left hand over the right on the next phrase. Some pieces had a noble sentiment then changed to pure joy. Others were more solemn and then changed to declamatory. Before coming to the concert I had prepared myself to be numbed with notes into some kind of Baroque stupor, but every piece seemed to have its own unique flavor and attitude, and together they seemed transcendent. At just over three hours in length, this program was the longest that I had ever attended. Allowing for the 30 minutes of intermission between the first and second halves, plus a few minutes for Hewitt to partake of some liquid refreshment between sets, it still amounted to 150 minutes of piano music! Topping off the concert, were ten pages of comprehensive and insightful program notes that were written by Hewitt. Hewitt’s glimpse into Bach’s life during the time of these compositions and her commentary on each Prelude and Fugue demonstrate her depth of learning and emotional involvement in Bach’s music. I had to ask for a couple of extra programs to give to friends who could not attend the concert. In summary, I found this concert by Hewitt to be one of the most outstanding I have ever heard. The wow factor was off the charts. Hewitt is featured on a new DVD in which she talks about Bach. I haven’t seen the DVD yet, but you might want to catch Jens F. Laurson’s intriguing review on the Ionarts blog. The Columbia Symphony Orchestra will feature Jun Iwasaki, the concertmaster of the Oregon Symphony as the soloist in its final concert of the season. Iwasaki replaces Amy Schwartz Moretti who is unable to perform. This will be our first chance to hear Iwasaki as a concerto soloist. Friday, May 2, 2008 at 8:00 p.m.
Monday, May 5, 2008 at 7:30 p.m.
Oregon Symphony’s concert on Sunday evening contained an intriguing sampler of pieces from three eras of music: late Baroque, Romantic, and the Twentieth Century. On the program was music by Johann Christian Bach, Ludwig van Beethoven, Richard Wagner, and Bohuslav Martinů. Two of the work received their first performances with the orchestra and the Bach piece required an unusual formation for two chamber ensembles. Juanjo Mena, principal conductor and artistic director of the Bilbao Symphony Orchestra, directed all of the works on this eclectic program. Mena has appeared with the Baltimore Symphony several times since his North American debut with them in 2004. He is scheduled to conduct that orchestra again in November. For Bach’s Sinfonia in E-flat major for Double Orchestra, Opus 18, No 1, the musicians split into two chamber ensembles, which included a modicum of brass and woodwinds plus a harp in the middle. The violas sat behind the violins, which looked odd, but didn’t hinder the great sense of interplay between the orchestras. J. C. Bach, the eleventh and last son of J. S. Bach wrote some subtle melodies into this piece, and they were nicely exchanged between the ensembles. All of the strings showed plenty of nimble finger-work and the accelerandos were clear and crisp. Often the ensemble on Mena’s left would start a theme that would be joined, parried, or echoed by the opposing ensemble. This exchange resembled a pleasant conversation between friends, and the overall effect was delightful, though not very deep. After finishing the Sinfonia, the orchestra took up its regular formation in order to play Martinů’s The Frescoes of Piero della Francesca. Martinů wrote this work in 1955 after become inspired by Francesca’s famous paintings in the Church of San Francesco in Arezzo, Italy. This piece relates to the paintings in an impressionistic manner rather than in a literal sense. Right from the outset, the orchestra painted a large canvas of sound. I heard chirping violins and woodwinds, trumpet calls, shortened glissandos, warm melodies for the cello section, a spooky bass passage, and so many arresting combinations of sounds that it was hard to surmise. Some passages seemed to be influenced by jazz. I did have the sense of opaqueness in the music as if we were seeing or hearing through layer after layer until we arrived at a restful place at the very end. Few recordings of the Martinů piece are available, but one of them, curiously enough, was done by the Oregon Symphony’s conductor laureate, James DePriest with the Malmo Symphony on the BIS label. It was odd that DePriest never programmed this piece with the Oregon Symphony because it would favor his strength to conduct broad, sweeping works. After intermission, the orchestra performed Beethoven’s Symphony No. 2 in D major, Opus 36. Beethoven wrote this cheerful, exuberant work during a time when he realized that he was going deaf, an incredible feat that defies imagination. Under Mena, the orchestra played the Beethoven with balance, but it seemed to lack some fire. The crescendos and decrescendos didn’t lead anywhere in particular. I thought that Mena could’ve asked for more variation in tempi or tried to bring out some aspect of the piece, but didn’t get that sense. So, the interpretation was more polite than interesting. The concert concluded with Wagner’s Overture to Tannhäuser, a brilliant piece that worked well as a final number for the evening. The bassoons were very pronounced in the opening passage of the pilgrim’s theme, but everyone in the orchestra got a chance to shine. Principal clarinetist Yoshinori Nakao gave his exposed solo the calm, clear sound that was just perfect. The attentive audience was completely quiet when the orchestra returned to the pilgrim’s theme and gave the orchestra a hearty round of applause after the final, majestic chords died away.